Losing mittens and other personal possessions isn’t a modern-day woe: it appears that our Stone Age ancestors misplaced their personal belongings just as often as we do. 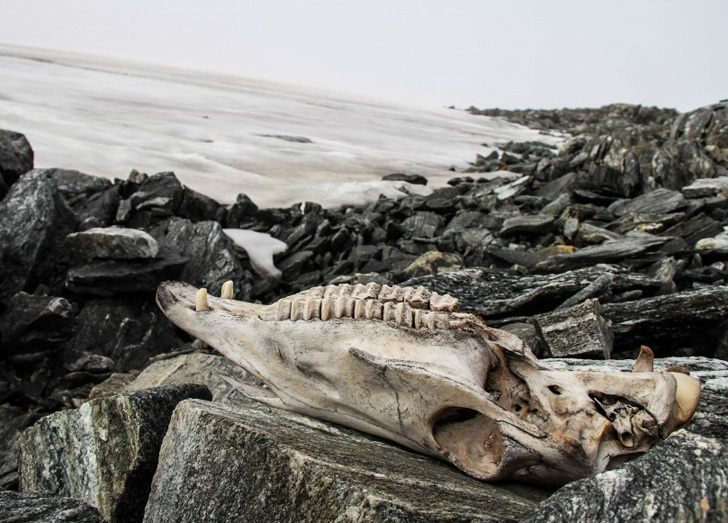 An archaeological team working in Oppland County, Norway, has been doing research among the melting glaciers, and discovered hundreds of discarded or lost items now revealed by the receding ice. The Earth experienced a fairly warm period about 7,000 years ago, but the centuries of cold that followed covered many parts of the world (like Norway) in thick layers of perennial ice. Now that climate change is warming things up again, the ice is melting away and revealing the ancient layers beneath them. Among the artifacts found by archaeologist Lars Pilø and his team are Stone Age knives, arrow shafts, small tools, and shoes, as well as Viking era horse skulls and hiking staves. The horses may have died during the difficult trek over the mountain, while the personal items… well, if we lose stuff unexpectedly, one can only assume that our predecessors did too. Most of these artifacts have been found along a mountain route that would have been used quite often as people travelled to upland summer homes, or to trade with neighboring villages. The majority of them are associated with hunting, like arrows and small knives, etc., but the occasional shoe or mitten has turned up as well. Interestingly, similar pieces are being discovered in the Rocky Mountains and the Andes, as ancient ice all over the world melts away to reveal its hidden treasure. These items allow us to catch a glimpse into the day-to-day lives of Stone Age people, and it’s fun to see that they probably weren’t all that different from those of us living today. Metal knives in the Stone Age - that's new. A stone age knife with bone handle. Viking era horse skull: the animal may have died during the mountain crossing. 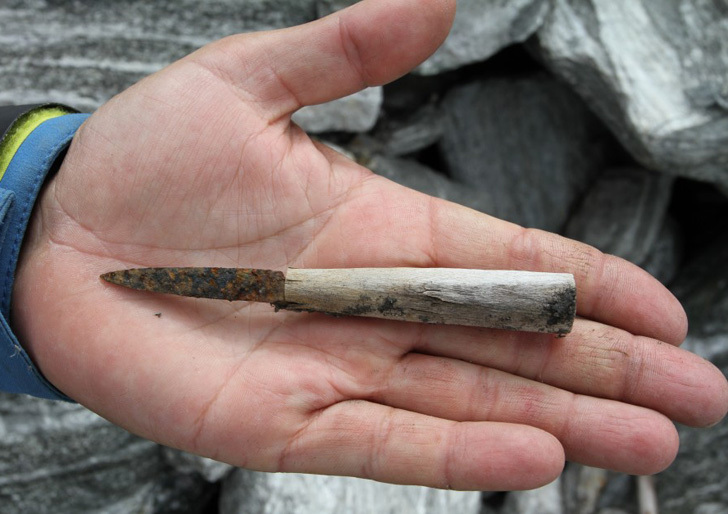 A Stone Age arrow revealed by melting glacier ice.